Closed- Winner is Saira H. Congrats! Are you a Red Robin Royalty Rewards member? I have been for about two years now and we enjoy the perks membership comes with. The fact that it's FREE is number one. I love seeing the number of entrees we have purchased add up to a freebie (every 10th item is free). It is really nice receiving email updates about daily meal deals and promotions. Oh, and let's not forget your FREE Birthday burger! Red Robin is a fun spot to celebrate birthdays. Red Robin has recently added another perk to their Royalty Member card with their Burgers for Better Schools. By being a member, you can log into your account and add a K-12 school of your choice. A percentage of your dining bill will then be given to that school. This is such a great idea since so many families dine there regularly. This is like fundraising for your child's school without feeling like a chore. This is a win-win for parents and their PTO/PTA. I really encourage you to add your child's school. ·Participating in Burgers for Better Schools is as easy as becoming a member of Red Robin Royalty. Red Robin Royalty members can sign up for Burgers for Better Schools on their account dashboard on Red Robin’s website or by visiting http://www.redrobin.com/betterschools. If you are not already a Red Robin Royalty member, sign up for free and select your child’s school BEFORE your visit! We dined there on Labor Day to celebrate our younger daughter's 19th birthday. We had a party of 6 and as usual, we were well taken care of despite the restaurant being jam-packed. Their servers always seem to have a lot of energy and even with many tables to wait on, they never make you feel like they have forgotten about you. My daughter was thrilled with her complimentary birthday sundae and song. They put on quite show at Red Robin. Our entrees were cooked to perfection and I can't ever say no to those bottomless fries. And the burgers? They are the BEST! I can't ever finish the whole thing because they are so big. In addition to its many burger offerings, Red Robin serves a wide variety of salads, soups, appetizers, entrees, desserts and signature Mad Mixology® Beverages. 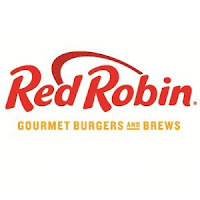 Be sure to connect with Red Robin on Facebook, Instagram and Twitter. This giveaway is open to U.S. Residents only and will end on September 25, 2015. One winner will be contacted via email to claim prize. Be sure to follow all rules in Rafflecopter widget for all entries to count. Good luck! The Red Robin information and gift cards have been provided by Red Robin. All opinions are 100% my own.